This patch modifies the gui to read users_rt.conf instead of users.conf. The config file users_rt.conf is created by executing the script realtime_extens.pl using #exec method of asterisk. The script reads extensions from database and users.conf. This realtime GUI is not suitable for large Asterisk PBX systems with more than 250 extensions. The patch can be downloaded from here. The README file in the asterisk-gui source directory gives detailed instructions to install and enable asterisk gui. 3. Enable #exec in config files. Add the line 'execincludes = yes' in asterisk.conf and reload asterisk. 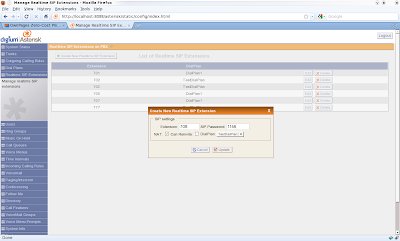 The GUI will now have a link 'Realtime SIP Extensions' from where you can manage realtime SIP extensions.